California has established ambitious goals to reduce energy consumption in buildings, including a policy goal for all new residential buildings to be zero net energy (ZNE) by 2020. Now the Department of Energy's Lawrence Berkeley National Laboratory (Berkeley Lab) has launched two projects to help the state meet its ZNE building goals. One project will provide detailed cost and performance modeling of ZNE homes and identify barriers while the other seeks to ensure acceptable indoor air quality in ZNE homes that use natural gas. The California Energy Commission (CEC) is providing $2 million in funding for the two projects. The DOE's Building America program is also supporting the air quality project, the results of which will inform DOE's Zero Energy Ready Home program. ZNE buildings essentially generate as much as they consume on an annualized basis, and California has led the way in the United States in laying the path towards ultra-low energy buildings. Carbon dioxide emissions from residential and commercial buildings make up about 23 percent of the state's overall greenhouse gas emissions, of which about 14 percent are from electricity generation sources and 9 percent from building heating fuels. "Getting to zero net energy will be a process," said Berkeley Lab researcher Brett Singer, who is leading the air quality project. "These two projects will help the state with both its near-term ZNE goals as well as longer term strategy." California has just a few hundred ZNE buildings now, while the number of new housing starts is roughly 100,000 a year. "On the face of it, it seems like a quantum jump, but the state is preparing through existing standards, driving towards that objective," said Max Wei, a Berkeley Lab researcher leading the second ZNE project. Wei will analyze the cost-effectiveness of various approaches to lowering energy use in single family and multifamily homes, such as comparing all-electric homes to homes with gas-based heating. "If we want to achieve deep carbon reductions then ultimately we want to sharply reduce or eliminate natural gas consumption," Wei said. "Another key modeling area is energy storage and demand response and how these could be implemented to lower overall costs." For example, Wei will investigate the cost implications of an entire neighborhood or community that does not have any natural gas infrastructure. Another question he will be looking at is how to implement offsite renewable generation. "There's the concept of community solar or shared solar—they're emerging business models," he said. "Maybe it's across the street, in a parking lot, or further away. How would you implement that, and what are the costs and benefits?" Wei will produce modeling and scenario results for various climate zones with the goal of informing future ZNE policies. One key activity will be a detailed survey of builders on current and expected future costs. "For example, if we find that all-electric homes are more cost-effective in some regions of the state, then that would be an interesting finding," he said. For the foreseeable future, California will continue to build homes with gas-based appliances, and as those homes get more energy-efficient, usually by being "tighter" or less leaky, ventilation becomes a more important issue. The second Berkeley Lab project will look at how to provide ventilation to maintain indoor air quality in these airtight homes. "The kitchen generates a lot of pollutants, especially in homes with gas burners," Singer said. "We want to efficiently remove those pollutants where they're generated so we don't waste energy over-ventilating the whole house." "This project will help the state to set requirements for kitchen ventilation that effectively solves the problem of cooking-related pollutants," Singer said. "We will study it experimentally and through simulation." 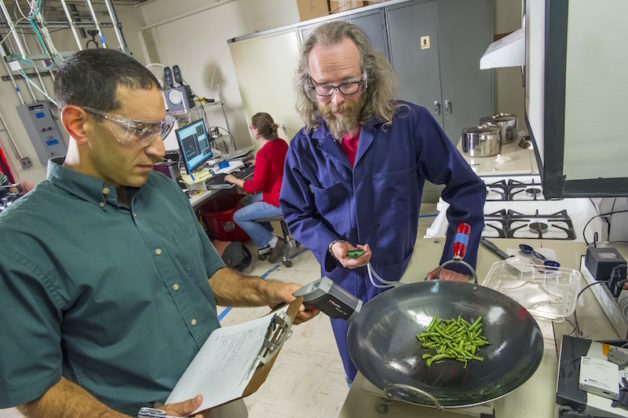 Berkeley Lab's indoor air team has been doing research in this area for years, everything from evaluating different kinds of range hoods to surveying consumer behavior on why people do or don't use them. Their testing has found that many range hoods remove less than half of burner pollutants. Now they will look at whether California's building code, which currently has a minimum airflow requirement for range hoods, should be adjusted for improved health outcomes and energy savings. "It might be better to have a standard for capture efficiency rather than airflow," said Rengie Chan, another Berkeley Lab researcher working on the project. "We will also test microwave range hoods, which are popular but currently don't actually meet the code requirements." Whether homes are gas or electric or both, Singer said these projects will have a public health benefit while saving energy: "The trajectory of California's energy code is towards a future of zero net energy homes. Our projects should go a long way towards removing some of the barriers."